The Paper Boutique: Silhouette Mega Sale and Giveaway! Silhouette Mega Sale and Giveaway! I am so grateful to Silhouette for sponsoring another Silhouette Portrait cutting machine giveaway! One of my lucky subscribers or followers will win their very own Silhouette Portrait! Yahoo! Thanks Silhouette for your amazing generosity! Wow!! To enter to win the Silhouette Portrait cutting machine, you need to be a follower of my blog. You can sign up over on the right side of this blog (if you are not there already). And leave a comment under this post, only one comment per person please. For an additional chance to win, please subscribe to my blog and leave an additional comment on this post that you did. You have until midnight MDT on Sunday July 28th to enter and the winner will be announced on Monday July 29th. Now are you ready for a mega sale and I mean mega? 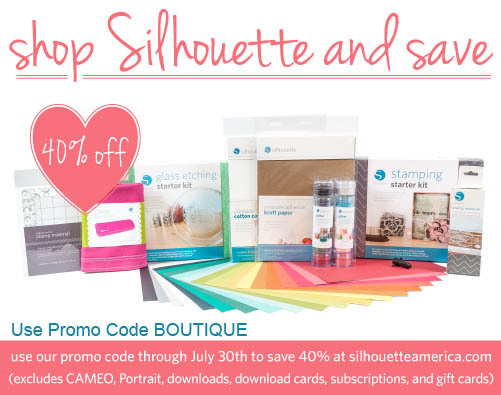 All of Silhouette’s consumables, both new and existing are 40% off from July 23rd to July 30th! Silhouette consumables are all of the physical products that are used with Silhouette machines as well as the Silhouette Studio® Designer Edition software. It does not include the machines, shape downloads or subscription payments. What a wonderful sale! Click here and type in the Promo Code BOUTIQUE when you order to receive the savings. Here is a sneak peek of one of my favorite new products. I can’t wait to try this amazing kit and make my own stamps! And remember that any of their new products that are in stock are also 40% off! Be sure to click here to visit Silhouette’s blog to see the latest product. You are going to love the new releases. Hint….one of them involves glitter! Thanks for a chance to win the Silhoutte! It would be so wonderful to create some home dec items with it. Great giveaway! Would really love to win. Thanks for the chance. I follow your Blog on Bloglovin and would love to win the Silhoutte!! My girlfriend has one and makes fabulous cutouts for her projects. Thanks for the chance to win! What a wonderful sale! Thanks so much for sharing this info and code! Also a Google friend follower. Thanks for the chance to win the sihouette I would be taking it with me this winter for sure. You always have great giveaways! It would be wonderful to win!! Thanks to you and Silhouette for this opportunity. Thanks for another chance to win another great prize. I have followed your blog for some time now. I've been a follower of yours for a long time. Thanks so much for the chance to win a Silhouette! I'm excited to see the stamp cutting, that would be an awesome feature! Thanks for a chance to win! I am a follower of your blog. Wow! I love the idea of making my own clear stamps! It would be wonderful to win a Silhouette ! I am also a follower of your YouTube channel! I think that's what your post meant to say! At least that's how it's been in the past, a post for the blog follower & a post for the YouTube follower! Thanks for the opportunity to win a Silhoutte. I am a "follower by email"
Thanks for a chance to win a Silhoutte Linda!! I am already a follower of your blog! I am already a follower of your blog and check it out every day. Thanks for the chance to win! I am also an email subscriber and look forward to receiving your emails. thanks! Wow yet another giveaway, Thanks for the chance to win one of these great machines. I cant wait to see all the new stuff they have this week. Thanks for the awesome opportunity to win a Silhouette!! I would love one to create home decor items as well as cards and other crafty items! I am already a follower of your blog via email and I look forward to it every week. I follow your blog. Thanks for the lovely giveaway! Thanks for another possibility to actually get my hands on one of these fabulous machines. I'm a follower of your blog, on pinterest, and U tube. Love the glass etching - would love to win! 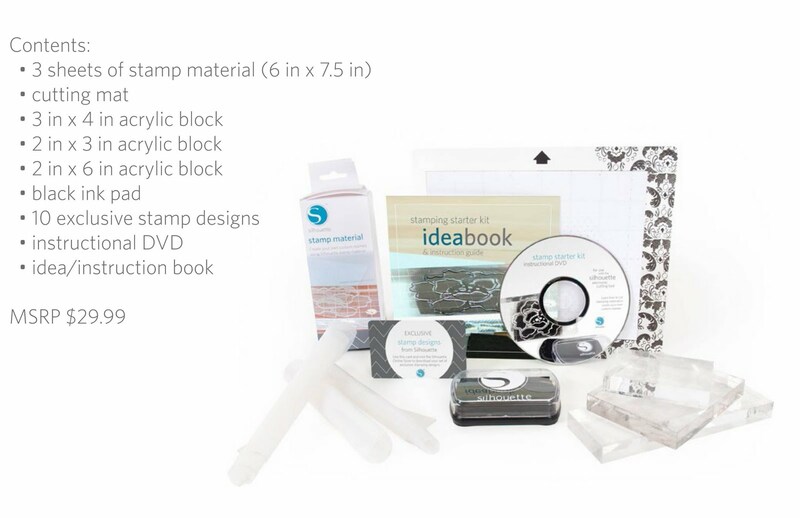 The Stamping Starter Kit looks so fun! Can't wait to see it in action! Thanks, Linda, for another chance to win. You are awesome. I love receiving your e-mails and your Yellowstone pictures. I am also from Montana. Great sale for sure!!! And Silhouette is very generous to be giving away another machine! Thanks as always! Thanks for the chance who win!! I follow you via GFC - Ellen Casper. How Exciting! Would love to win a Silhoutte. Thank You for the opportunity. So happy for a chance to win! Thanks toyou and to Silhouette for a chance to win. I have been wanting a Silhouette for so long! I am a follower. i am a subscriber to your blog, thanks for the chance to win and for the 40% off. Thanks so much for the chance to win the Silhouette. I am a subscriber to your blog. Thanks for the chance! Would love to add this to my craft room. Thanks for sharing the information about the sale and your fantastic giveaway! What an awesome giveaway and sale! Thanks for the opportunity to win! I am a follower of your blog through Bloglovin. Thank you for the chance to win. I am an email follower. I would love a Silhouette - love your blog and am an email subscriber. Yay! I'm a follower of your blog. Would like to win. Thanks Linda! I am a long time follower and want to thank you for the chance to win a Silhoutte! I follow your blog and love what I see you make. Thanks for the chance to win a Silhoutte! I'm a follower and would so like to win. Thanks for the chance. Such a fun giveaway, already a follower, thanks for the chance to win! What a fun and creative giveaway. Love your blog. Thank you for this awesome chance to win the Silhoutte. I am so ready to own a cutting machine to use in my paper crafting. Thank you for this great giveaway! I am a follower! Another machine giveaway so soon - wow! I am already a follower and really enjoy your blog. I want to win this sooo bad!!!! I am a blog follower on Google Friend Connect AND a subscriber! Thanks for the opportunity. My favorite of your days is Make It In Minutes Mondays. Again, thanks. I am following via google! I'm subscribed via email to your blog! Thank you for the chance! I am a follower of your blog already, it would be wonderful to win the Silhouette! What a wonderful giveaway and thanks you for the chance to win. Thanks for another chance to win! I would love to win this and give it to my sister who is just starting out :) I am an email subscriber. Thanks again! Thanks for the chance to win. I follow your blog on Bloglovin! I am a blog follower. Thanks for the chance to win! Great giveaway! I cannot wait to see the new products! I am also an email subscriber. Thanks for another chance to win this great prize! Great giveaway. I'm an email subscriber and a subscriber to your blog. Another awesome giveaway! I'm a google follower! I am also an email subscriber already too!! It would be so great to win a Silhoutte! I've been following your blog for quite some time. Thanks for all the great inspiration! One of these days I might just win a the Portrait, but I'll keep tryin'. I've been a follower of your blog for quite some time. I'm heading over the the Silhouette store to make some purchases. I would love to win the Silhouette. I want one so bad and it has beenon my wish list for a while. thanks for the opportunity. I am a follower and fan. I'm being wanting to get the Silhouette, so it would be so wonderful to win. Thanks for a chance to win. Love your blog. I'm a big follower....grateful for all the creativity shared here....and feeling lucky this time...my bday is on the 30th...lol. What a great giveaway! Thanks for the chance to win. I follow your blog and your You Tube Channel! I would love the chance to win the Silhouette like so many others. I love making anything with paper and it would be so much easier with the Silhouette. Thanks so much for the chance. I also am a very happy subscriber and undercover lurker! That Stamping Kit Starter is so cool! I wanna try it! I also started following your blog! I am also a subscriber, thanks! Thank you for the chance to win one of these fabulous machines! I receive e-mail from you. Already a subscriber. Thanks for the chance. Thanks for the mega sale information and a chance to win! New to your blog, but love it! already a follower, just subscribed by email.. thanks! Love receiving your emails. Would be soooo happy to win this give a way. What great promo (wish I could take advantage of that) and what a great giveaway - so I really, really hope I win it! Another great giveaway! I'm a follower of your blog. Thanks for the chance to win. Another awesome giveaway Linda. Thanks for a chance to win. Follower of your blog and email subscriber. Thanks again for this chance. would love to win a new Silhouette. I am an advid paper crafter and can invision millions of crafts using this machine. Another Silhouette giveaway. This is very generous of you. Thanks for the opportunity to win. I'm already a follower with Bloglovin and Feedly. A Portrait would be a perfect addition!!!! Im a GFC follower and would LOVE to win!!! Thank you! Thanks for another wonderful opportunity! Hope to have a Silhouette one of these days. Wow, I am so excited your are giving us another chance to win a Silhouette. I will keep trying, hoping this is lucky one. Thanks so much for the chance! I subscribe to your blog, FB, and YouTube. WOW - I would REALLY love to win! It would be awesome to use one of these machines. Thanks for the opportunity to win one, I love your blog. I am also a follower of your blog...I also look forward to receiving you newsletters. I'm a long-time follower of your blog and I thank you for this awesome opportunity to win a Silhoutte!!! I would love to have a Silhoutte Portrait. It looks like it cuts so nicely. second chance..I subscribe to your blog...and would luv one of these babies!!!! I am a follower and have been for quite some time. Thanks for the chance to win! Thanks for the chance to win! I don't have a Silhouette but I sure do want one! Oh my. What a fantastic giveaway. I am a long time follower of your blog and would love to win The Portrait. Thanks so much to you and especially Silhouette for giving us yet another chance to win. I have been a follower for some time. Love all your wonderful projects. Thanks for another chance to win a Silhouette. Thanks for the great giveaway! I'm already a follower of your blog and your youtube channel. Hi Linda! Silhouette keeps coming out with more and more amazing products!!! Thank you for hosting this giveaway :) I've been following you on feedly, email and watch your videos as well! Love your blog-so glad I found you-way back! Would LOVE a Silhouette! Thanks for the chance to win! It sure would be fun to win a Silhouette! Thank you for the chance to win. I enjoy following your blog. Hi Linda! Thank you so much for another wonderful give away! I have been a follower of your blog for some time now. Cannot wait for the new Silhouette products to be released, and try the new stamp product. Already a follower. Thanks for a chance to win!! I follow you blog and would love to win the silhouette. Thanks! Linda~I'm so excited that Silhouette is giving you another portrait to give away and I get another chance to try and win it for my friend. I'm a follower and look forward to getting my email updates. Wow! Another chance to win. I'll gladly take it. How exciting I am really looking into the silhouette and it would be beyond a dream come true if I won it !! Thank you and silhouette for this amazing chance ! Would love to win a silhouette! Thanks for giving me a chance! Thanks for the chance to win. I am a long time follower. I have been following your blog forever now and absolutely love it. I would love to own a silhoutte!!! I really love all the wonderful projects you make using yours. Love the idea of SVG cuts. I love your blog and have been subscriber for years. I've just discovered your website and signed up for your emails. I'm getting back into crafting again after many years of being absorbed with work and being a mom. My goodness how the crafting world has changed!!! I see that with things like the Silhouette I've got a lot to learn, but what fun! Yay! Thanks for the chance, as my budget is very limited and I can't afford to buy one. Fantabulous giveaway! The possibilities endless! I am a blog follower and youtube subscriber! You are an inspiration! Thanks for the chance to win! Thanks so much for the chance to win the Silhouette. I have been a follower for a long time. great give away! Thanks for the chance to win something awesome! Thanks for the chance to win! I just became a follower of your blog. Looking forward to seeing some of your creations. Thanks so much for the chance to win the Silhouette! Would love to win the Portrait for crafting on-the-go! I'm an email subscriber! Thanks for the chance to win! Thanks for the chance to win!! I would love it!!! I am also excited about your blog and so happy I found it!! Thanks!!! What a treasure it would ne to win this! I've been your blog follower for a long time and would love to have this tool to continue my craft and paper project designing. I've enjoyed your indoors ideas. I was able to make wedding invitations for both our children on my little cricket. What a treat it would be to have the more functional Silhouette! Thanks for another chance to win. I am already a longtime follower of your blog and a subscriber to your YT channel. It would be great to have another toy. Love it Linda, thanks for the chance to win. Wow, I would love to try this out, thanks for the chance to win. Been following for a long time :). Thanks for the chance to win! Wow! How generous of Silhouette to offer you another machine to give away! Thank you for the chance to win! Thanks for the chance to win this wonderful item. I would love to win it so thanks for another chance to win one. I never win anything but am always willing to try.I LOVE Silhouette!! Great giveaway! Thanks for the chance to win it!!! love your blog! Thanks for the chance to win. I LOVE Silhouette products! Thanks for the chance to win I have just purchased a Silhouette Portrait and can't wait to use. This would make a wonderful addition. I follow your blog and would love to win a silhouette! I think the glass etching looks wonderful. OMGoodness!!!!! I would love to win this!!!! I am a long time subscriber! Thanks for the chance to win! Thanks for another chance to win such a lovely give away. I am a follower, and love the inspiration you give us all. Thanks again. I am a follower of your blog. Thanks for the chance to win. Thank you so much Linda for the chance to win the Sihoutte - it would be so much fun!!! Love your blog!! Also, I have been following your blog for some time. And love all the creative ideas you share. Thanks for the chance to win! I am a subscriber. So glad I found your blog! 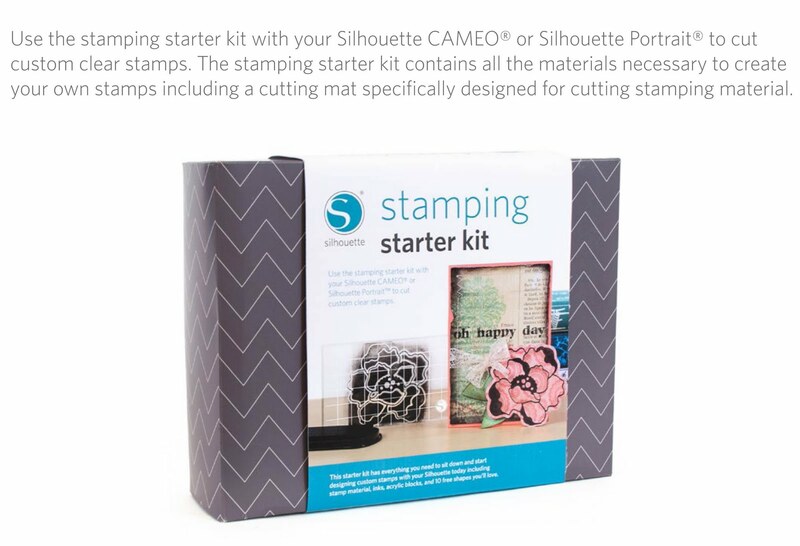 Just bought a Cameo and would love to win the stamp starter set and send your pictures of a true beginner's work. Would love to win and try out that stamp kit. Would love to win... I'm a follower and I'm a subscriber. Thanks for another awesome giveaway.. I would love to win this! Thank you for this awesome give-a-way! As always, love your blog. I have been following for quite some time. Excited to have the chance to win a Silhoutte. I use a Cricut, but would like to give the Silhoutte a try!